Thought provoking, emotional, touching, sad, sensitive, must read, are a few of the words our readers have used to describe Me Before You. When I first read that Me Before You was about a man involved in an accident, who becomes a quadriplegic I was not at all sure that I even wanted to read it. After all I knew that even the happiest ending could not really be a happy one. Me Before You ended up being one of the best books I have read in a long time. Yes, it is sad, however it is a beautiful story and at times I could not help but to smile. It may not have gotten 5 omelets, but it came closer to 5 than any other book we have read in the last few years. You do not want to miss out on this book! Just finished reading it – crying through the last five pages. Thanks for the recommendation. Hi Mary Ellen! I shed a few tears myself! Have you read anything really good lately? What is your book club reading? One of our recent favorite books is THE LIGHT BETWEEN OCEANS by M. L. Stedman (set in Australia around 1920). The Light Between Oceans is next on my list. Everyone seems to love it! Keep in touch! Welcome Melinda! You will not be disappointed. 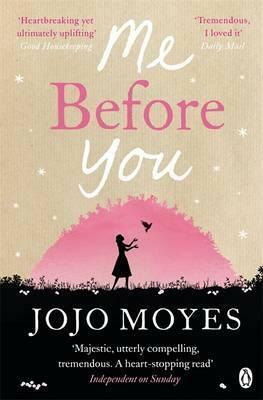 Me Before You is a wonderful book!